CRS back in action at Coastal GeoTools 2017! Presenters share their CRS tools in break out groups. 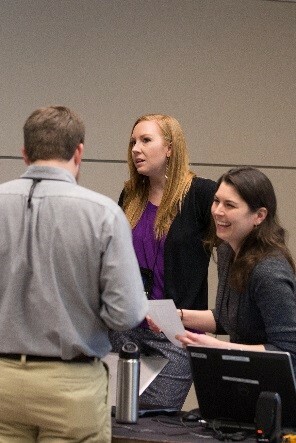 Left to Right: Dan Rizza (Climate Central), Laura Flessner (TNC), Melissa Rosa (NOAA), and Jeff Stone (ASFPM). Photo courtesy of NOAA OCM. 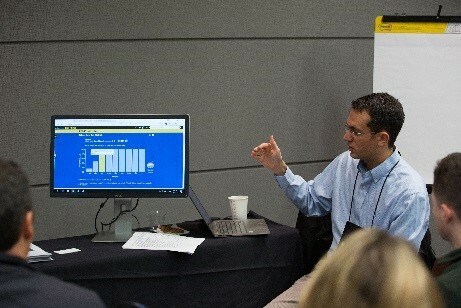 I recently participated in a special interest meeting (SIM) showcasing new resources to use with FEMA’s Community Rating System (CRS) while at Coastal GeoTools. I would like to share with you some of the highlights from that SIM. Building on a GeoTools SIM held in 2015, Digital Coast partners teamed up with Climate Central to share their progress on the development of tools and resources to help communities increase their CRS credits. 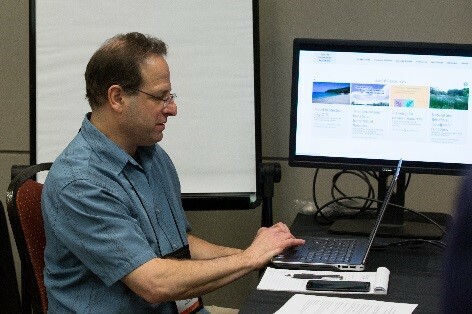 Coastal GeoTools provides a venue for data scientists, modelers, researchers, planners, and managers to explore solutions to address coastal hazards. The CRS is a voluntary insurance rating program offered through the National Flood Insurance Program and administered by FEMA that provides reductions in flood insurance premiums to participating communities that take steps to reduce their risks and undertake comprehensive floodplain management. During the 2015 SIM, most participants prioritized the need for tools that inform the “Open Space Preservation (OSP)” activity, as it is a high point contributor and would most benefit their CRS score (resulting in greater flood insurance discounts). Energized by the feedback and level of excitement surrounding the CRS, Digital Coast partners set out to create decision support tools that would help communities take full advantage of the economic and ecological benefits of this program. After two years of collaborative tool development, Digital Coast partners including The Nature Conservancy (TNC), Association of State Floodplain Managers (ASFPM), Coastal States Organization (CSO), and NOAA joined forces with Climate Central to convene another CRS SIM at the 2017 Coastal GeoTools conference. Building on the 2015 SIM, each organization shared their progress on the development of tools and resources designed to help communities take advantage of OSP credit in the CRS. The goal for this SIM was to get usability feedback and examine how these products could be widely applied in the CRS planning process. The CRS Green Guide, being developed by ASFPM/CSO (through National Fish & Wildlife Foundation Hurricane Sandy Resilience Grant funding), shares the best “green” or “co-benefit” practices from the most successful CRS communities across the country. The “co-benefits” are the flood insurance rate reductions for policy holders and flood risk reduction that result when communities carry out CRS activities related to preserving the natural beneficial functions of floodplains. By focusing on CRS activities with “co-benefits”, a community can earn enough points to result in substantial premium reductions. Additionally, NOAA is developing a “How To” guide and GIS workflow that will provide the steps necessary to identify eligible open space and apply for OSP credits. One goal is for users to be able to interactively visualize the output from this workflow within TNC’s CRS Explorer web application which produces exportable maps and parcel tables to support the CRS review process and helps prioritize future OSP areas. The tool has been piloted in North Carolina, with planned expansion to the Gulf of Mexico. My role as a NOAA Fellow based at TNC is to support outreach and communication efforts around the CRS Explorer alongside the other CRS-related tools. Lastly, a community can use Climate Central’s Surging Seas CRS Guide to earn points through flood risk outreach and public engagement activities. I’m amazed to see how far we’ve come in two years! Participating in this year’s SIM, along with a full room of participants, reiterated the importance of this work for coastal communities across the U.S. Feedback from this year’s SIM will help guide expansion of these tools and further collaboration between these partners around a newly formed CRS Strategy with the ultimate goal of taking these tools to new areas throughout the country. I look forward to seeing the tools rolled out and getting used by all those communities.